Code of Ethics and Code of Conduct - What's the Difference? Code of Ethics and Code of Conduct – What’s the Difference? What’s the difference between a code of ethics and conduct? The terms “Code of Ethics” and “Code of Conduct” are often mistakenly used interchangeably. They are, in fact, two unique documents. Codes of ethics, which govern decision-making, and codes of conduct, which govern actions, represent two common ways that companies self-regulate. They are often associated with large companies, and provide direction to employees and establish a public image of good behavior, both of which benefits businesses of any size. Sometimes referred to as a Value Statement, it behaves like the Constitution with general principles to guide behaviour; outlining a set of principles that affect decision-making. For example if an organization is committed to protecting the environment and “being green”, the Code of Ethics will state that there is an expectation for any employee faced with a problem, to choose the most “green” solution. It works on the bases of “treat others as you would like to be treated.” When faced with ethical dilemmas or debatable situations, what’s articulated in the Code of Ethics can help guide decision making. Provides the meat and potatoes to the Code of Ethics. A Code of Conduct applies the Code of Ethics to a host of relevant situations. A particular rule in the Code of Ethics might state that all employees will obey the law, a Code of Conduct might list several speciﬁc laws relevant to different areas of organizational operations, or industry, that employees need to obey. The Code of Conduct outlines specific behaviours that are required or prohibited as a condition of ongoing employment. It might forbid sexual harassment, racial intimidation or viewing inappropriate or unauthorized content on company computers. Codes, along with other measures, have helped some companies dig themselves out of scandals, and have helped many companies build a healthier work climate and reputation. Both a Code of Ethics and a Code of Conduct are similar as they are used in an attempt to encourage specific forms of behaviour by employees. 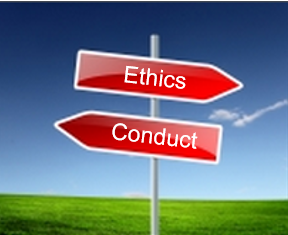 Ethics guidelines attempt to provide guidance about values and choices to influence decision making. Conduct regulations assert that some specific actions are appropriate, others inappropriate. In both cases, the organization’s desire is to obtain a narrow range of acceptable behaviors from employees. With similarities, comes differences. Both are used in an attempt to regulate behavior in very different ways. Ethical standards generally are wide-ranging and non-specific, designed to provide a set of values or decision-making approaches that enable employees to make independent judgments about the most appropriate course of action. Conduct standards generally require little judgment; you obey or incur a penalty, and the code provides a fairly clear set of expectations about which actions are required, acceptable or prohibited. Bigger organizations sometimes have both Codes in separate formats, or they are sometimes combined into one general Ethics document that blends principles for the right action with a list of actions that are required or forbidden. Many smaller businesses can survive without a formal code of ethics or code of conduct; for example if a business has 1-10 employees, generally everyone is talking with each other and interacting with each other every day. So communicating appropriate behaviour is much easier. However, as smaller businesses grow their employee numbers, ethical hazards and risks can increase, so having these documents can help shape cultural expectations about behaviour, and they also serve as a solid marketing tool for potential business partners or clients. Either way, whatever type of Code an organization chooses to employ, it’s critical that it is treated consistently in every instance of wrongdoing. The Code needs to apply to every employee from the ground up, and no matter how small the violation, appropriate discipline needs to take place. For example, if your Code stipulates that theft of company property is prohibited, and an employee takes home one pack of post-it-notes from the supply inventory, that’s theft, and should be treated as such. We believe that a great Code and a strong company culture is the heart of a successful organization. We strive to help organizations build a culture of integrity, transparency, and accountability. An organization’s culture is different in all industries: we believe there’s no one-size-fits-all solution for building and adopting a strong organizational culture. But we do strive to provide all organizations with a solution that can be customized to fit the varying needs of different organizations, while helping to build and strengthen internal cultures. One step in building a successful culture is with the integration of a strong compliance program, including a whistleblower hotline. This is a powerful tool for any organization to implement in their proactive measures to ensure their business success and grow their strong culture where employees can thrive.